Ooty tourist Guide - India's..
HolidayTravel offers this extra ordinary tour for all Techies, Exploreres and Travellers wanting to Visit India. This package has special combination of Technology, with Royal heritage, Religion and Finally retreat to famous Blue Mountains ( Nilgiri ) destinations called Ooty. Ooty Mysore Tour Package is covered with Hills, Mountains, Monuments, Mystic Temples and Gardens. Bangalore, Mysore and Ooty are among such places that reflect historical significance, natural beauty and cultural affluence. This wonderful trip offers you a chance to see the different color of traditions, cultures, natural views and picturesque landscapes. This tour will start from Bangalore having connectivity worldwide. In this package you will stay 2 night in Bangalore and Mysore each and rest 3 nights stay would be in Ooty. Arrival at Bangalore airport or railway station and our representative will transfer you to hotel. After complete check in formalities you will visit some famous places of Bangalore which includes Bangalore Palace, Vidhana Sabha, Ganesh Temple. After sightseeing you may have lunch at any nearest Restaurant, after that visit to enjoy Bangalore gardens and Mallathahalli Lake. By the evening come back to hotel and overnight stay with hotel. After breakfast check out from hotel and proceed to Mysore which is 150 km away from Bangalore. Upon arrival visit some famous attraction which includes Chamundi hills, Palace of Maharaja of Mysore. After sightseeing you may have lunch at any nearest Restaurant, later visit Mysore Zoo and Vrindavan garden. By the evening come back to hotel and overnight stay with dinner at Mysore hotel. After breakfast start your day by visit some more famous places of Ooty which includes 'Queen of the Blue Mountains', that includes a visit to Dodabetta peak for a spectacular view. Later visit nearest restaurant for lunch. After that move towards to visit Avalanche Lake, Pykara River, Ooty Mountain Railway, by the evening come back to hotel and overnight stay with dinner at Ooty hotel. Lunch: Served at Amma's Kitchen which is very famous Restaurant for Indian pure veg food. Jaganmohan Palace, Mysore: Jayalakshmi Vilas Mansion: This palace was built in 1905 by Chamaraja Wodeyar for his eldest daughter Jayalakshmi Devi. This mansion has three wings and contains a series of twin Corinthian and Ionic columns, regal pediments and oval ventilators. The mansion was originally built with a cost of Rs. 7 lakhs. This mansion was acquired by the Mysore University to house its post-graduate campus. It was renovated in 2002 from funding provided by Infosys foundation. The main hall in this mansion is the Kalyana Mantapa which has an eight-petal shaped dome with stained glass windows with a gold-plated Kalasha(tower) at the top. A new gallery called as Writer's Gallery has been created in the Kalyana Mantapa hall that will exhibit personal items, photographs, awards and writings of renowned writers of Kannada. A special illumination system has also been added to this heritage structure. This mansion is said to be the first university museum complex in the country. Gardens of Mysore: Brindavan Gardens is a show garden that has a beautiful botanical park, full of exciting fountains, as well as boat rides beneath the dam. Diwans of Mysore planned and built the gardens in connection with the construction of the dam. Display items include a musical fountain. Various biological research departments are housed here. There is a guest house for tourists. It is situated at Krishna Raja Sagara (KRS) dam. Mysore Zoo: one of the oldest and most popular zoos in India. Located on the outskirts of Mysore, the zoo is home to a wide range of wild species. The official name for the zoo is Shri Chamarajendra Zoological Gardens, though it is known commonly by its shortened name. Mysore Zoo is one of the city’s most popular attractions. It was established under royal patronage in 1892, making it one of the oldest zoos in the world. St. Philomena's Church is a church built in honour of St. Philomena in the city of Mysore. It was constructed in 1956 using a Neo Gothic style and its architecture was inspired by the Cologne Cathedral in Germany. In 1926, Thamboo Chetty who was a secretary to the Maharaja of Mysore, Nalvadi Krishnaraja Wodeyar obtained a relic of the saint from Peter Pisani, Apostolic Delegate of the East Indies. This relic was handed over to Father Cochet who approached the king to assist him in constructing a church in honour of St. Philomena. The Maharaja of Mysore laid the foundation stone of the church on 28 October 1933. In his speech on the day of the inauguration, the Maharaja is quoted to have said: The new church will be strongly and securely built upon a double foundation — Divine compassion and the eager gratitude of men.. The construction of the church was completed under Bishop Rene Fuga's supervision. The relic of St. Philomena is preserved in a catacomb below the main altar. Open to visitors from 8:00AM to 5:00PM. 3:15 pm - 6:30 pm: Cover reaming sightseeings which are St.Philomina's Church, Chamundi Hill, Big Bull, Maharaja's Palace, Art Gallery, and Beautiful Brindavan Garden (Colour Full Musical Fountains). If you are a nature freak then you don’t have to bother when to visit Ooty. Even the monsoon procures a tempting nature. Ooty as an ideal escape for crazy couples, The temperature in Ooty in October nestles in between 15 degree to 20 degree whereas the bracing November bears a temperature swirling around 12 degree and 15 degree. 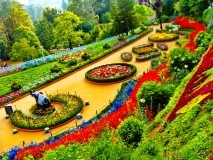 Botanical Gardens: The Government Botanical Garden is a botanical garden in Udhagamandalam, near Coimbatore (Ooty), Tamil Nadu state. The Gardens, divided into several sections, cover an area of around 22 hectares, and lie on the lower slopes of Doddabetta peak. The botanical gardens in Ooty is home to many rare species of trees. Chief among them are the cork tree, the only one of its kind in India. Doddabetta Peak: Doddabetta is the highest mountain in the Nilgiri Hills at 2,637 metres (8,650 feet). There is a reserved forest area around the peak. It is a popular tourist attraction with road access to the summit. It is the fourth highest peak in South India next to Anamudi. There is a reserved forest area around the peak. It is 9 km from Ooty,on the Ooty-Kotagiri Road in the Nilgiris District of Tamil Nadu, South India. It is a popular tourist attraction with road access to the summit. Avalanche Lake: It was formed naturally in the year 1823 due to a massive landslide and therefore is named as Avalanche lake. Small waterfalls falling down from the encircling mountains creates a picture perfect ambience. Other activities like trekking and camping are also popular among tourists. Ooty Lake: Ooty Lake is an artificially constructed lake with picturesque natural surroundings. Originally constructed for the purpose of fishing, the lake has become all but an important tourist landmark in Ooty. Situated at a distance of approximately 3km from the city of Ooty in the Nilgiris district is the artificial Ooty Lake which spreads over an area of 65 acres. The lake is skirted by tall Eucalyptus trees while its waters are fed by streams that meander through the hills. Those who have a keen interest in photography can surely get some amazing clicks of water birds along with the beautiful Nilgiri mountain ranges in the backdrop.The main attractions you find surrounding the lake are the boat races and boat pageantry organized as a part of Summer Festival in Ooty. Emerald Lake: Emerald Lake is situated near the Emerald Village in the Nilgiris district in Tamil Nadu.It is located in a region called the silent valley,about 25 kilometers from the Ooty town. Emerald dam which is a lovely lake and it has a scenic view and the view is mesmerizing. The Avalanche and Upper Bhavani are two dams which is near to the Emerald dam. It is a beautiful place with pine trees and farms sorrounding the blue water of Emerald. Ooty Mountain Railway: Nilgiri Mountain Railway (NMR) is a treasured element and fabled charm of Nilgiris since 1899. This Nilgiri rail system is unique as it is the steepest one in Asia. It was declared a World Heritage Site by UNESCO during 2005. It’s a 46-kilometre beautiful toy train journey that starts from Mettupalayam and goes through tunnels, curves, bridges and beautiful scenery to reach Ooty in five hours. From 300 feet to 7200 feet, the Ooty toy train is definitely a ride to cherish. Here’s a tip – try to sit on the side that looks out in to the valley for the best views on the way up. Wax World: The Wax World contains beautiful statues of Indian freedom fighters like Mahatma Gandhi, Bal Gangadhar Tilak, Gopal Krishna Gokhale among many others. The museum also has wonderful replicas of social figures like Mother Teresa and our former President, Dr.A.P.J.Adbul Kalam. This is private museum and not supported by goverment yet. There is a small entry fee collected to enter the museum. The museum itself a british time bungalow with few rooms. This museum presents wax statues of National heroes and freedom fighters of India. Free parking is available near the museum. Lalbagh Botanical Garden: This enchanting garden is set on 240 acres with a rare collection of tropical and sub-tropical trees and plants, and a majestic glasshouse built on the lines of London's Crystal Palace. It derives its name "Lal Bagh" from a collection of red roses that bloom throughout the year there. Lalbagh takes on a festive look during India's Independence Day and Republic Day, with a captivating show of over 200 varieties of flowers. Bangalore Palace: Bangalore Palace Built in 1887 by Chamaraja Wodeyar, Bangalore Palace is inspired by England's Windsor CastleThis beautiful palace has Tudor style architecture, with fortified towers, arches, green lawns, and elegant woodcarvings in its interiors. Tipu Sultan's Palace and Forts: Tipu Sultan's Palace and Fort was originally built by Chikkadeva Raya in mud This was completed by his son, Tipu Sultan, in 1791. The Hindu temple seen in the courtyard of the fort is the proof of Tipu Sultan's religious tolerance. Attara Kacheri: Located just opposite to the Vidhana Soudha, the two storey building 'Attara Kacheri' houses the Karnataka High Court. The construction dates back to the year 1867 under the reign of Tipu Sultan, the Emperor of Mysore He named the newly constructed building as Attara Kacheri meaning 18 offices or departments. Mr. Lewin Bentham Bowring, a British civil servant in India who served as the commissioner of Mysore (from 1862 to 1870) visualized and planned the construction of the building. The work on the building started in the year 1864 and was completed in 1868. The red building made of brick and stone is famous for its Gothic style of architecture and is built in the European classical style. There are a number of other prominent buildings worth seeing like Public Library, Visveswaraya Industrial and Technological Museum, the Venkatappa Art Gallery and the Government Museum.